The Episcopal Church honors St. Matthias this Wednesday, February 24th. If you want to observe this day at home, you’ll need to plan ahead a bit. Contributor Maria Nolletti Ross provides some background on the saint and an idea for your table. For my Saints and Recipes blog, I studied how saints’ historic lives and lessons apply to us in our modern era. For some saints, I found plenty of documents containing first-person accounts or secular records. For others, I found merely a wisp of reference on a rare historical page. For still others, we have only what’s written in the gospels. We honor St. Matthias on February 24 because he was chosen and named in the gospels. The Apostles chose Matthias out of an unnamed group of devoted followers of Jesus to replace Judas Iscariot as one of the Twelve. They appealed to Jesus in heaven to choose between two men in the casting of lots. Some believe Jesus communicated his choice via the arrangement of the sticks. 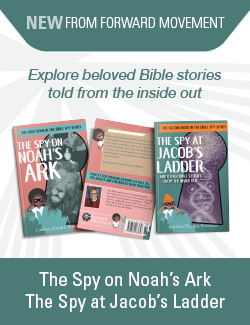 Soon after, Matthias’s began his mission as witness to the life and resurrection of Jesus Christ. Many believe he died a martyr around 80 A.D.
To be named one of the Twelve Apostles is a great honor. Matthias received this honor because he faithfully served the Lord among many other unnamed followers. It reminds us that whether or not our volunteer work is recognized by those who will record our name, Jesus notices and Jesus appreciates. Unnamed volunteers are as unsung and as necessary as ordinary bread upon the table. The bread upon Jesus’ table, possibly served or purchased by St. Matthias, is similar to modern-day pita bread. On February 24th, you could include pita bread on your table to honor this saint. This daily bread honors the memory of St. Matthias and all the other unnamed biblical and modern-day volunteer saints. 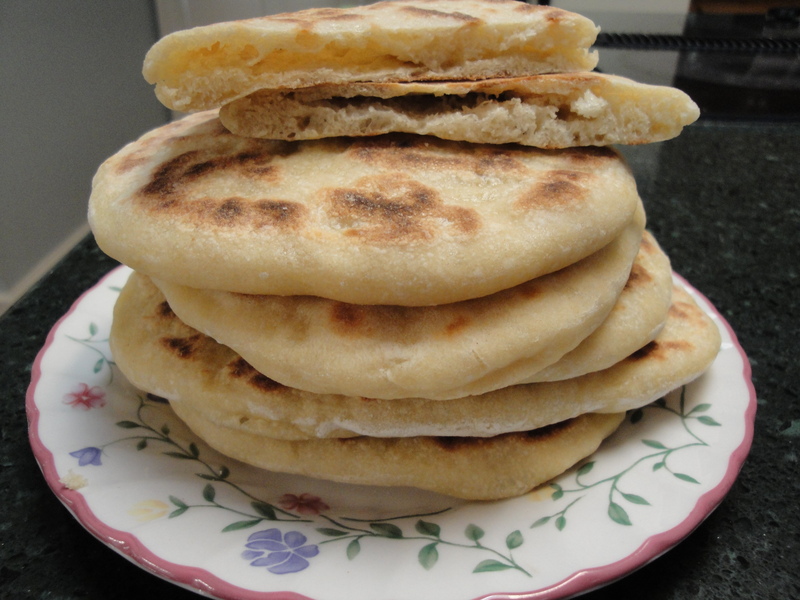 A recipe for homemade pita bread is below. If you are home with children, you might include them in making pita bread to honor St. Matthias on Wednesday. If not, most grocery stores carry pita bread. 1. Heat first ½ cup water until it reaches 100 to 110 degrees F; pour into liquid measuring cup. Stir in yeast. Quickly stir in 1 teaspoon sugar. 2. After 10 minutes, thick foam should have developed on top indicating that the yeast is proofed or alive. Add second ½ cup water at room temperature and 2 tablespoons olive oil. 3. In electric mixer with dough hook, combine flour and salt. Pour in yeast mixture, and mix until combined. If dough sticks to sides of bowl, gradually add more flour until it no longer sticks. Knead dough on low speed for about 5 minutes until smooth. 4. 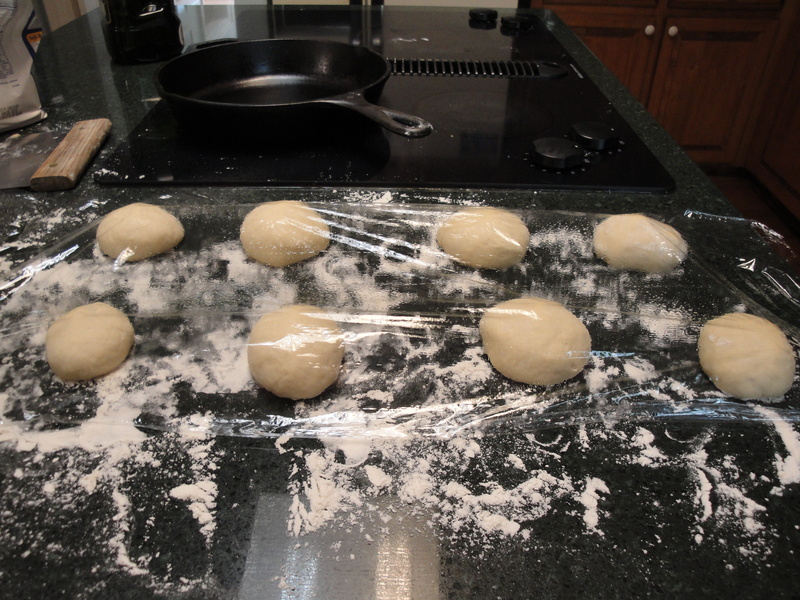 Place dough on clean and floured counter top or bread board and shape into ball. Place dough ball in large glass or oven-safe bowl coated with two teaspoons of olive oil. Roll ball around until it’s also coated with the oil. Cover bowl with a damp towel. Heat oven to “warm,” place bowl in oven, then TURN OVEN OFF. Proof (let rest) until dough has doubled in size, about 1 1/2 hours. 5. Place dough on floured surface and gently pat down into a rectangle about 1-inch thick. Cut dough into 8 pieces. Shape each piece into a ball with a smooth top by pulling dough from the sides and tucking underneath. Cover dough balls with a piece of lightly-oiled plastic wrap and let rest for ½ hour. 6. “Wash” hands in flour and lightly sprinkle flour onto work surface. 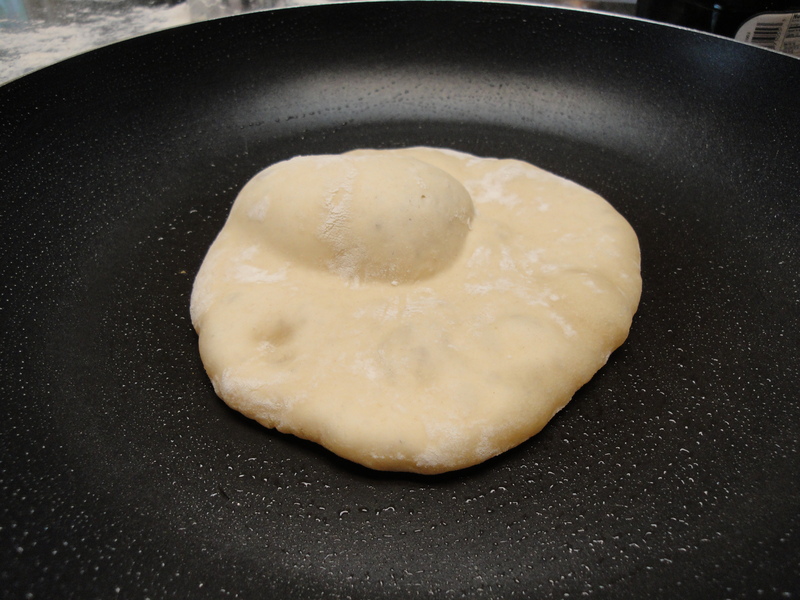 Shape each dough ball into a flat round bread about ¼ inch thick. Let rest for 5 minutes. 7. Brush a tiny amount of olive oil in frying pan and set at medium to medium-high heat. Cooking one at a time, lay each dough disk onto the hot pan and cook for about 1 1/2 minutes until bread begins to puff up and bottom begins to brown in spots. 8. Flip and cook 1 minute. Flip again and cook for another ½ minute. Remove and place on plate. Repeat with remaining disks. 9. When breads are cool enough to handle, cut in half, and gently separate the tops and bottoms to form pockets. Fill with grilled meat and vegetables or spread with butter and serve with lentil stew. They can also be cut into triangles and served with yogurt cucumber dip or hummus. Thanks. Is there a k link to saints and recipes? Thanks. Is there a k link to saints and recipes? Found it!